It’s extremely important to know that the property you are renting or the property you own as a landlord is electrically safe. With new regulations in England coming into force for smoke alarms and the staggering increase in category 1 hazard homes being rented out, it’s imperative to raise awareness on the risks that the rental market holds. That’s what the government have called us and it is a name we have rightfully earned. In the last ten years, the number of households living in the private rental sector in England has doubled from 2.2 million to 4.4 million. It is a staggering increase, which shows how popular the rental market has become and also how lucrative the property business is. With house prices climbing more and more each day, people are turning to renting simply because they cannot afford to buy a home. Landlords have capitalised on this steep increase in tenants. It’s reported that 48% of private renters are 25-34 year old, with families being the most common household. It used to be a starting point for homeowners, to get one step closer to being on the property ladder. But now it has become a landing point, with many not being able to afford leaving their rental home. Still, 61% of tenants remain positive and say they expect to buy a home in future. This optimism is what has kept the rental market alive and thriving with numbers constantly growing, however prices in the private rental sector are rising too and tenants now face having to spend one third of their income on housing costs. With over 1 million families raising children in privately rental homes, it’s worrisome to know that over half of those children are living in a category 1 hazard households. The hazards are categorised as severe threats to health or safety, such as: severe damp, excessive cold or risk of falls. 16% of privately rented homes are unsafe and fail to meet the legal minimum standards for housing. This poor standard of rental property has led to thousands of accidents annually in the UK, with an average of 4,000 incidents involving electrics. It’s important for both tenants and landlords to understand their responsibilities within the property, and be aware of the risks if they aren’t properly handled. Tenants and landlords should be aware of the condition of the property they are moving into/renting out, and take action should they find any hazardous conditions. Each nation in the UK is different in how electrical safety is regulated; some taking the step in the right direction with the implementation of laws to abide by. With many aware of the importance of gas safety in the home, it’s also important to shed light on why tenants and landlords should be concerned over the electrical standard of the property. It is highly recommended that private landlords carry out an Electrical Installation Condition Report (EICR) every five years, tested by a registered, competent electrician. It is also advised to make sure the property has proper RCD protection. An RCD is a Residual Current Device, which is a life-saving device that will prevent you from any dangers of shocks, should you touch a live element, and will cut the power when there’s a path to earth. Thousands of fires caused by electrical faults in the home could have been reduced if an RCD had been fitted. Both tenants and landlords are advised to check to see if an RCD is fitted and working in the property already. It’s as simple as pressing a button, every 6 months. Circuit breakers are an important part of your consumer unit and to fire safety, as they prevent circuit overloads and surges by automatically switching off. The purpose of a circuit breaker is to prevent from fires and to save lives. A regular EICR will ensure that the electrical installation system complies with both the current edition of the Wiring Regulations and Part P of the Building Regulations. Landlords should make sure that tenants receive a copy of the periodic inspection, in the form of the Electrical Installation Condition Report (EICR). On December 1st 2015, Scotland will become the first nation in the UK to make it a legal requirement for landlords, under sections 13(4A) and 19B(4) of the Housing (Scotland) Act 2006, to guarantee that their properties are electrically safe and supply tenants with proof that a periodic inspection has taken place. This law covers the inspection of: all electrical appliances in the home supplied by the landlord, all installations for the supply of electricity in the home, and electrical fittings and fixtures (switches, plugs, etc). Landlords will need to hire a qualified electrician to perform the inspection of the property. Inspection of electrical appliances will be carried out via PAT testing, for safety purposes. It is recommended to carry out PAT testing annually in properties to ensure that there is no damage to appliances that could cause harm to both parties. Check your appliances today for a sticker on the plug, showing when it was last tested and when the next check is due. In England, Wales and Northern Ireland there is still no legal requirement to supply tenants with an EICR. However, the electrical system in the property should still be periodically inspected, as all electrical wiring and installations do deteriorate over time and new faults can arise. It is best practice to organise a periodic inspection before a new tenancy starts and during the tenancy in five year periods. Advances are being made to advance the safety of tenants in rental accommodation. In July, a bill was been submitted in Wales, to make it law to carry out an EICR every five years in privately rented properties. It is hoped that England and Northern Ireland will follow suit, by making it law for electrical systems in rental properties to be checked every five years. No matter where you are in the country, make sure the electrician that carries out any electrical work in the property is a registered, competent electrician. 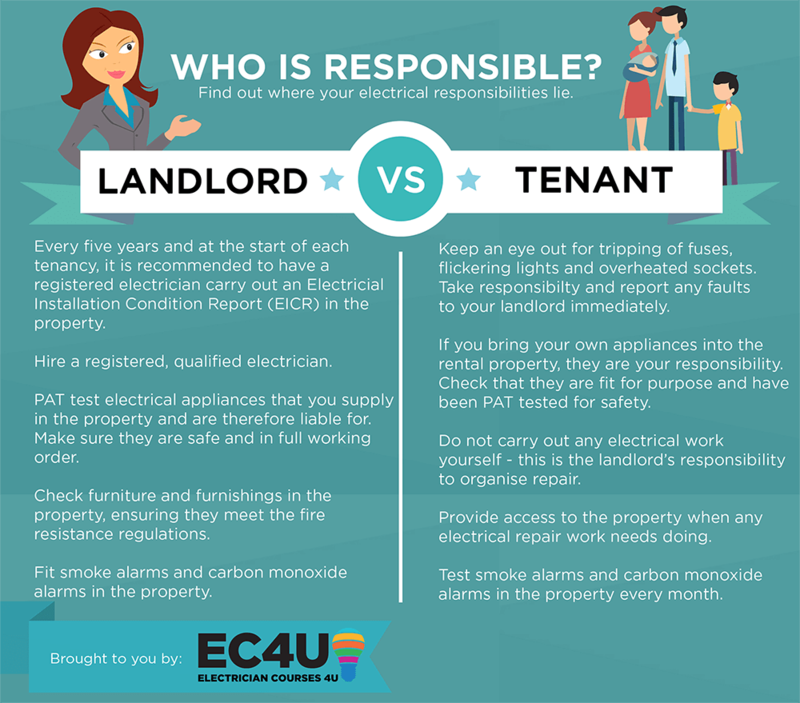 Landlords should use the Electrical Competent Persons Register to find a local electrician nearby and to ensure the highest standard of work is carried out. The electricians on the register are accredited to a government approved scheme, qualified, insured and able to self-certify their work. Hiring from the register gives both the landlord and renter peace of mind that the work is carried out to the highest standard and meets current regulations. From 1st October 2015 it will be compulsory for all landlords in England to install smoke alarms on every floor of the property and a carbon monoxide alarm in rooms containing a solid fuel appliance or they face being hit with a £5,000 fine. This new law will ensure the fire safety of tenants, as well as offering protection against carbon monoxide. This requirement has been supported by England Fire and Rescue services and has been done to prevent 26 deaths and 670 injuries a year. The government are now granting Fire and Rescue services across England nearly half a million free alarms to give out to landlords of privately rented properties. Contact your local Fire and Rescue Service for more information about how you can submit your application to receive a free smoke alarm. Currently, only 90% of homes have smoke alarms installed, when it should be 100%. Alarms are a necessity in every home, just like water is. You are 4 times more likely to die in a fire in the home when there is no working smoke alarm. Test your alarm (by simply holding down the test button) upon arriving in your new rented accommodation and every month after that. As a tenant, you want to feel safe and secure in your rented home, so take action and if you haven’t got appropriate alarms fitted, please contact your landlord. If your landlord fails to take action, contact your Environmental Health Officer at your local council for more information and help. Electrical safety in the rental home is crucial. Tenants have a responsibility to report any problems and landlords must ensure that all electrical installations and equipment are safe and up to the current standard (BS 7671). However, difficulties arise when faults or problems are not reported appropriately and therefore accidents are more likely to occur. Students are at a higher risk of being exposed to faulty electrical work in their privately rented accommodation, due to the quick turnover and the lack of awareness. A recent report showed that 1 in 4 students have experienced faulty electrics in their rented home, which is one too many. The landlord must ensure that a high standard of care is given in the home, no matter who the tenant is; a young family, an elderly couple or students, they all are exposed to similar situations that can potentially put their lives at risk. Refer to our list to check out where your responsibilities lie. Ensure electrical installations and appliances are safe and in full working order for when tenants move in and maintained throughout the duration of tenancy. Every five years and at the start of each tenancy, it is recommended to have a registered electrician carry out an Electrical Installation Condition Report (EICR) in the property. PAT Testing appliances that you supply in the property and are therefore liable for. Check furniture and furnishings in the property, ensuring they meet the fire resistance regulations. Fit smoke alarms and carbon monoxide alarms in the property, to ensure safety of the rental home as well as the tenants. Keep an eye out for constant tripping of fuses, flickering lights and overheated sockets – take responsibility and report any faults to your landlord immediately. Your landlord is legally obliged to ensure that your electrical system and appliances are kept in repair and in proper working order. If you bring your own appliances into the rental property, they are your responsibility. Check that they are fit for purpose and have been PAT tested for safety. Do not carry out any electrical work yourself – that is the landlord’s responsibility to organise repair. Provide access to the property, when any electrical repair work needs doing. What should you do when you move in? When you move into a privately rented property, you must make sure: you carry out all the necessary checks of appliances, gas and electric systems, most importantly. Our list highlights the key areas to look out for when you get the keys to your property, to make sure you are safe in your new home. Make sure your landlord is registered with the NLA, an accredited organisation that protects you as well as the landlord. By using an accredited landlord, they adhere to certain guidelines, such as: protecting your deposit, giving you 24 hours notice for accessing the property, providing you with an agreement and urgent response with repairs being dealt with within 3 working days. If possible, get a copy of the Electrical Installation Condition Report (EICR) from your landlord when you move in. This ensures the condition of the electrics is safe. Do visual checks on appliances to check they have been PAT tested and are safe to use. Once you have moved in, make sure to test all the smoke alarms and carbon monoxide alarms in the property. If there are no alarms in the home, contact your landlord. Check meter locations in the property, and take pictures of them to mark the start of your tenancy. You should also take pictures of the meter readings at the end of your tenancy, so you have proof to show your billing companies. Check all electrical wiring and appliances in the home, take pictures of any faults and report to your landlord. In case of emergency, it’s important to have a contact number for your landlord. If you can’t contact the landlord, try your letting agency or local council. If there is a power cut in your rental home, do not panic. Check the lights and switches, to see if they still work. If they do, there is a more serious problem with your consumer unit. Report the problem to your landlord ASAP. If you spot an electrical fault that would require an electrician, do not attempt any electrical work yourself. Contact your landlord and ask them hire a registered, qualified electrician to carry out the work. If a light bulb has gone in the rental home, replace this item yourself as it is your responsibility. If you cannot contact your landlord for some reason, try the letting agency. If all else fails, contact your local council for advice. The tenant assumes all responsibility for reporting any problems to the landlord. If the landlord ignores, contact local council. If a fire occurs in the property, call 999 first before your landlord. Want to find out more about electrical safety in rental properties? Find out why it’s important your rental home has a home safety certificate carried out!